It is missing a version! Dol published in 2015 this album, DOL 734H! **Serves me Right- moody start with vibes. *Groovin' High - Dizzy's tune it swings. Can you dig it? The a Sidewalks of New York - starts out bounds on the vibes. ** Just one of Those Things. Some joyful and swinging Cole Porter! This is a serious ensemble with Wynton Kelly, Art Blakey and Percy Heath joining Adderley and Jackson. 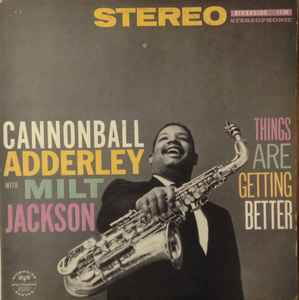 Like the Milt Jackson album "Plenty, Plenty Soul" on which Adderely performed the previous year, this record is fairly soulful and bluesy, and like most Jazz on Riverside it's very accessible. There's nothing spectacular here, but they're all decent numbers. Listen to the title track "Things Are Getting Better". A nice bright, easy going tune. You must agree it sounds exactly like Arlo Guthrie's side long Alice's Restaurant which followed 10 years or so later. Maybe A.G. heard the melody in a cafe or by a street musician jamming on it.